Fueled by the dramatic changes in politics and race relations, and continuing urbanization of the country, the 1960s and 1970s were unquestionably one of the most fertile and revolutionary periods in the history of American music. 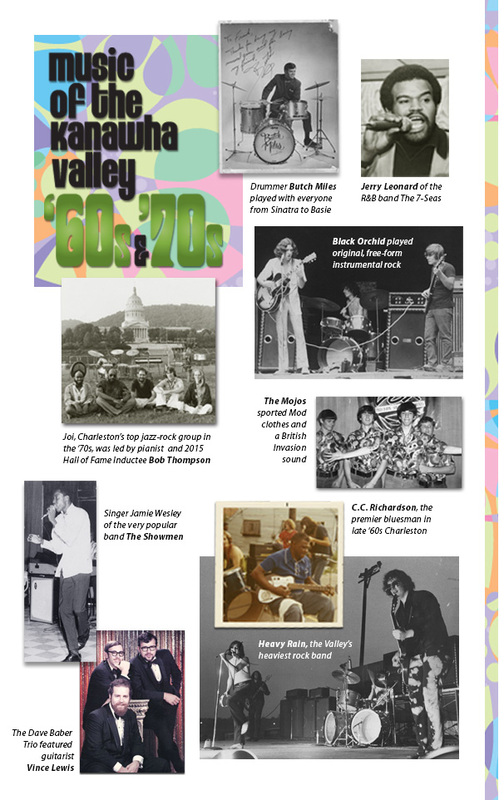 Like many areas of the country, the Kanawha Valley supported a music scene that, compared to today, was unusually rich, varied and vibrant, and one that reflected the diverse elements of rock, pop, blues and soul, as well as country, jazz and gospel. It was also a time of experimentation, and a number of bi-racial groups – unusual considering Charleston had only recently been desegregated – were cooking up their own blend of rock ’n’ soul. The Kanawha Valley boasted dozens of groups and artists that were of national caliber, including some who would leave the state and achieve national prominence. For instance, Ralph Morman, the rough-edged singer for Heavy Rain, went on to play and record with The Joe Perry Project (Aerosmith) and Savoy Brown while Skiffle guitarist Jack Griffith later joined Novo Combo, a quartet that featured Santana drummer Michael Shrieve. Signed to Polygram Records, Novo Combo opened for the Rolling Stones “Start Me Up” debut on the TV show Solid Gold. The scene consisted of heavy-hitting blues-rock bands like Quiet, Black Orchids and Heavy Rain, British Invasion-inspired bands like The Mojos (who reportedly had the highest rated record ever on American Bandstand’s “Rate-a-Record”), and soul bands that included The King Sound Interpreters, 7 Seas, and The Esquires. Meanwhile, the country scene was flourishing, thanks in large part to Buddy Starcher’s long-running show on WCHS-TV. In the mid-’70s, a different sound emerged from the valley with bands like Skiffle, Quint, Christina, Clear, Ebony and the Greek, Stratus and the acoustic Putnam County Pickers. The photos in this exhibit – along with the songs on the accompanying listening station – offer a visual and aural sample of that explosive musical era.